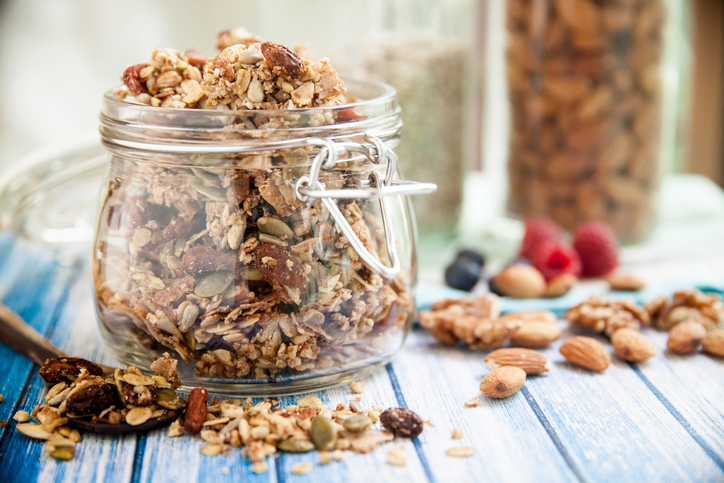 If you’re a fan of granola, buying it off the shelf regularly can be costly. Luckily, granola is easy to make and versatile. Plain yoghurt with granola, for example, is a healthy breakfast option. Alternatively, put granola in cereal, or have it with a bowl of milk and chopped fruit. You can also put it in a salad for crunchy, tasty goodness. This granola recipe features almonds, pistachios and raisins, but you can include or replace any other kind of nut, dried fruit and/or seeds you like, such as cashew nuts, walnuts, pecans, dried cranberries, figs, sunflower seeds and pumpkin seeds. Almonds contain lots of healthy fats, fibre, protein, magnesium and vitamin E. A handful of almonds a day will lower your blood sugar level, reduce blood pressure and lower cholesterol. It also cuts hunger pangs and promotes weight loss. The health benefits of pistachios include a healthy heart, weight management, better digestion, and reduced risk of diabetes and hypertension. Raisins are essentially dehydrated grapes and are packed with iron and potassium as well as concentrated B vitamins, to give you long-lasting energy. Heat the honey and oil over low heat till it begins to bubble. Remove from heat. Toss the oats, nuts and salt in a bowl. Stir the honey mixture in, coating everything well. Spread the mixture evenly on a tray lined with lightly oil-greased baking paper. Bake for 30–35 minutes at 160°C or until the mixture is golden and crunchy. Stir every 10 minutes for an even colour. Once baked, allow to cool, mix in the raisins and store the granola in an airtight container.